Sometimes the last thing a beginner needs is to read books written by longtime professionals or to take lessons from them. Not that it wouldn’t be a great feeling to say that you have fished with the best, but you may actually learn more from someone who is “not quite”. I’m not talking about another amateur or even a novice, but someone you would feel is a pro though they are not quite there. Have you ever asked a doctor to explain something to you? Whether it is an M.D. or a P.H.D. it seems as if they forgot how to speak in laymen terminology. My step father is a chemist (bachelors degree level) and I can’t understand him most of the time when he explains science to me. So if you are new to fly fishing (as I am) I suggest start from the bottom and enjoy. Those professionals have a lot of information to share with you and they would love to do so; but they may give you too much at once and scare you away. I have to admit that I have been guilty of trying to learn too fast and am forcing myself to slow down a little. This is something that should be therapeutic and relaxing; I don’t want it to cause me to burnout. When I wrote my article “Appreciation” I told you of all the free things I got at my last Project Healing Waters meeting. One of those items was the book shown in the picture above, “How to Improve Your Fly Fishing & Catching” by Tom McCoy. I said in that article that I would read the book and let you know how it goes. I had a lot going on this week but I am a man of my word. I must say that I enjoyed this book and another of Tom’s books this week. I don’t no if he deliberately tricked me or that I am just quick to misread or misunderstand but as I started reading this book he mentions his book called “How to Fly Fish for Trout, the First Book to Read”. Well you don’t start a series in the middle so I thought I better find that one. If you are as gullible as me, let me tell you now that it is not a series; you can read his books in any order that you’d like. Tom explains the title at the beginning of that book. He wrote it for a friend and anyone else that is a beginning fly fisher so that we can learn the basics from someone that does not speak above our head. Luckily for me I am a Kindle Unlimited subscriber and was able to download it for free. Although I did tell my wife that and she said ” If you don’t start reading more books at the cost of $10 per month then that book cost you $120). I guess she is right again. Let me tell you what I didn’t like about Tom’s books first. I really think the only thing that I didn’t like was the limited illustration. I’m the type of person that learns from seeing and though he included pictures of some of his trips with his family and friends he did’t have many pictures of the tips that he was sharing. The things that I did like about the books definitely outweighed the lack of illustration. First of all, Tom has a way of using his writing itself as the illustration. When he tells you where to cast your fly before and after a rock, under trees, off banks, in deeper pools that are oxygenated by the current flowing into them and so on, you can picture what he is talking about. When he tells you to cast your fly up stream and make a “d” or an “o” pattern at the end of your rod to make a correction you will understand him. I can’t explain the way he did. One way he illustrated the books in my mind is that I live where he does a lot of his fishing. When he talks of all of the creeks and rivers along State Route 17 in New York, I can see it all. Many people from around the world think of New York as all city; but the outdoors-men know different. Roscoe, NY is one of the most popular fishing towns in the United States (if not the world) and the Adirondack State Park covers more than 6 million square miles; that is larger than the state of Massachusetts! You can actually fit Yellowstone, Everglades, Glacier, and Grand Canyon National Parks combined into the Adirondack State Park. There Is a lot of land here and a fisherman would fail trying to fish all of it’s waters in his/her lifetime. 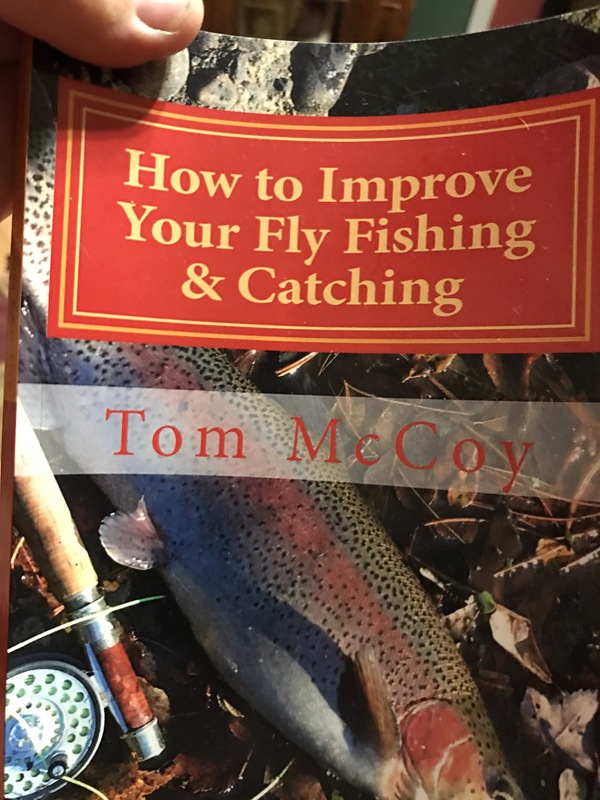 Lastly what I like about Tom’s book “How to Improve Your Fly Fishing & Catching” is that on page 87 he says that the book is listed on Project Healing Water’s site and that he donates the royalty. As a disabled veteran (Healing on the Fly) I am a member of Project Healing Waters. Therefore Tom has donated to my fly fishing education and healing. I would love to see him on the Willowemoc Creek or the Beaverkill someday and shake his hand. Maybe I’ll find him in one of the secret spots that he mentions in his books. Who knows, he may even teach me in person. Hey, it could happen!